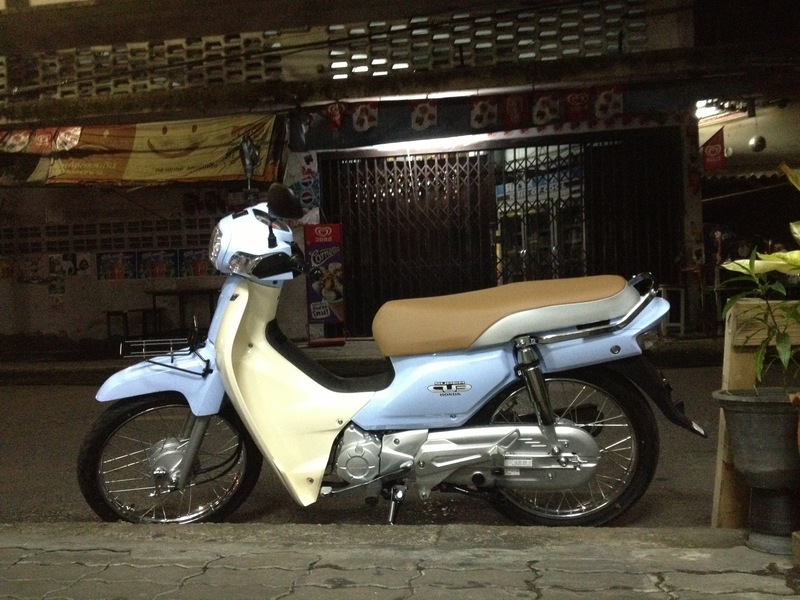 When we moved to Thailand I was itching to buy a CRF250L but despite selling a load of our stuff, including ‘Akane’ the VFR800 and ‘Cosworth’ the CG125 we were pretty poor. It seems that deciding on the spur of the moment that leaving the country just after renting a house and filling it with furniture is, financially, a really bad move. Thailand is full of really crappy looking scooters like the Honda ‘Wave’. Weirdly the Thai like things that are glitzy and bright and that just doesn’t jive with me. Also, the trend for scooter mod fashion is toward bicycle wheels on your ride. Even more weird! When I saw the Super Cub I was all set. It’s the modern version of the most numerous vehicle on the planet; a 110cc fuel injected (wow) four stroke based on the famous C90 (yes, to motorcycle nerds it’s famous. just ask Ed March) and semi automatic gearbox meant transport to Anne’s god forsaken post production job in the north of the city. Buying the thing was a odd experience. Firstly you have to have a work permit. Okay… then; “what about insurance?” Yeah, we can do that on our computer for (insert crazy small sum here). Weirder. We also ordered the official Honda accessories for it because we were due to do some serious 2up touring on it. Well, Touratech really need to get involved in the Thai accessories market because what eventually came were a pair of leatherette vinyl pannier bags with no support at all and a roughly welded steel rack that looked like it belonged on on the back of a fishing boat. Still, when people have hand made baskets wired onto their bikes you can’t complain. I was wondering why I was having trouble with the price too. Cheap? Jeepers. When in doubt; draw! Click to enbig. I have a strong feeling that the Japanese got bored with the Thai Honda execs and said ‘yeah, do whatever you want’. 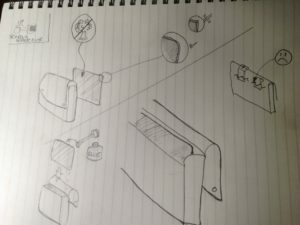 As such the rack started to rust almost immediately and the panniers ripped along the mounting straps prompting me to unsuccessfully attempt to get them mended at a place reupholstering car seats that was enfumed with glue and stacked with vinyl. I went back with a diagram. Still no luck. After re-learning the delicacies of the 4 speed semi-automatic gearbox we rode Look Mee all over the shop. As far as we could go within a weekend when Anne didn’t have to go to the extremely weird work environment**. That gearbox is pretty darn clever. Honda are great. They figured they needed to incorporate the gear and clutch mechanism into a foot lever because all the people riding would be holding bags of boat noodles, chickens, construction materials or their children with their left (clutch) hand. This means you don’t just slam in a gear. You click the bike into the next gear with your food and release it like a clutch. It’s pretty cool because you can use it for engine braking too. These things are not explained, but now you know. It appears I had forgotten that I rode an off road version of the C90 when I was a farmer. I scooted all over the place on the thing whilst checking labour gangs, supervising irrigation pipes, checking pumps and avoiding being gorged by wild animals; it was enormous fun. Also, a bloke called Nathan Millward rode one to the UK from Australia. That seems to be a thing now. I fully intended to take Look Mee (it means ‘Cub’ in Thai) to Cambodia but instead I got a horrible tropical disease and had to be in hospital instead. Subsequently we moved to Canada where such things are frowned upon and not really suitable for highway use according to the draconian Quebec ‘laws’. So we very sadly sold Look Mee to a friend in Bangkok and left with a tear in our eyes. **Why would you employ a world expert in a very specific piece of post production hardware and stick them an inferior one when you had said hardware? 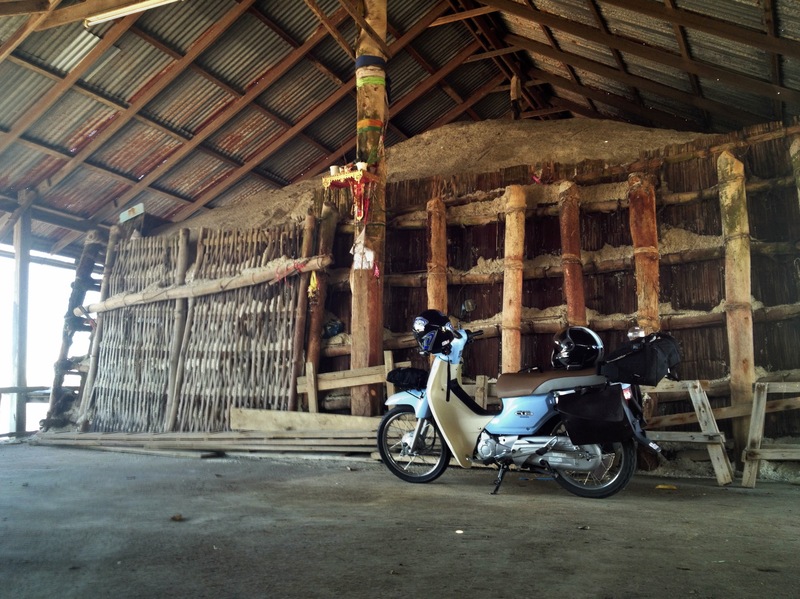 This entry was posted in Uncategorised and tagged Honda, Super Cub, Thailand. Bookmark the permalink.